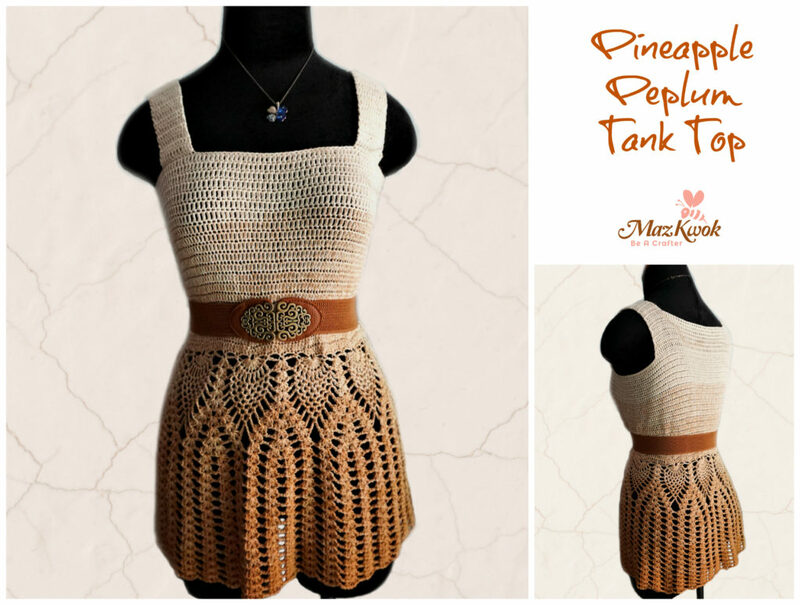 This crochet maxi dress is developed from my Pineapple racerback tank top pattern. 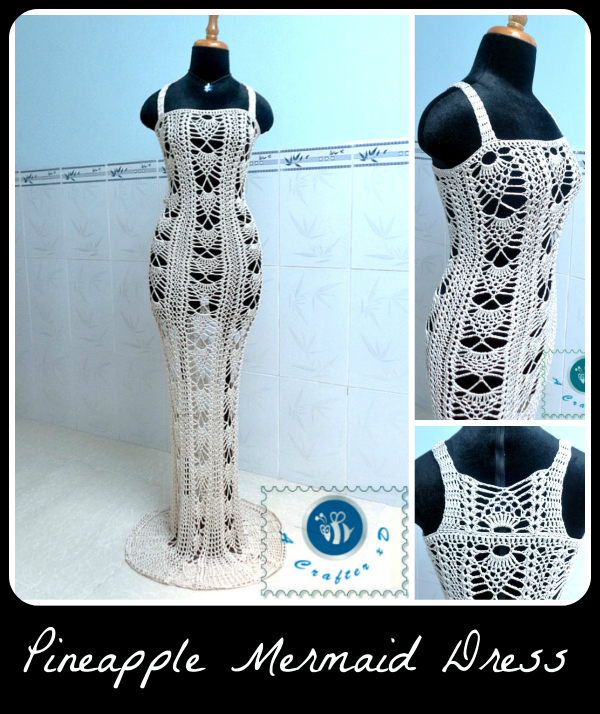 I always wanted to design a mermaid style crochet prom dress so here it is. R1: ch 114, sl into 1st ch to form round, 114 dc around, sl into 1st stitch to join. R2: *dc, skip 2 sts, 2dc-V stitch into next st, ch 3, skip 3 sts, sc into next st, ch 6, skip 3 sts, sc into next st, ch 3, skip 3 sts, 2dc-V stitch into next st, skip 2 sts, dc into next st * repeat ** 6 times around, sl into 1st stitch to join. R3: *dc, skip 2 sts, 2dc-V stitch into next ch2-space, skip next (2 sts and ch3-space), 9 tr into next ch6-space, skip next (ch3-space and 2 sts), 2dc- V stitch into next ch2-space, skip 2 sts, dc into next st* repeat ** 6 times around, sl into 1st stitch to join. R4: *dc, skip 2 sts, 2dc- V stitch into next ch2-space, ch2, skip 2 sts, sc into next st, ( ch3, skip 1 st, sc into next st ) x 4 times, ch2, skip 2 sts, 2dc-V stitch into next ch2-space, skip 2 sts, dc into next st* repeat ** 6 times around, sl into 1st stitch to join. R5: *dc, skip 2 sts, 2dc- V stitch into next ch2-space, ch3, skip next (2 sts and ch2-space), sc into next ch3-space, ( ch3, skip 1 st, sc into next ch3-space ) x 3 times, ch3, skip next (ch2-space and 2 sts), 2dc-V stitch into next ch2-space, skip 2 sts, dc into next st* repeat ** 6 times around, sl into 1st stitch to join. R6: *dc, skip 2 sts, 2dc- V stitch into next ch2-space, ch4, skip next (2 sts and ch3-space), sc into next ch3-space, ( ch3, skip 1 st, sc into next ch3-space ) x 2 times, ch4, skip next (ch3-space and 2 sts), 2dc-V stitch into next ch2-space, skip 2 sts, dc into next st* repeat ** 6 times around, sl into 1st stitch to join. R7: *dc, skip 2 sts, 2dc- V stitch into next ch2-space, ch5, skip next (2 sts and ch4-space), sc into next ch3-space, ch3, skip 1 st, sc into next ch3-space, ch5, skip next (ch4-space and 2 sts), 2dc-V stitch into next ch2-space, skip 2 sts, dc into next st* repeat ** 6 times around, sl into 1st stitch to join. R8: *dc, skip 2 sts, 2dc- V stitch into next ch2-space, ch8, skip next (2sts and ch5-space), sc into ch3-space, ch8, skip next (ch5-space and 2 sts), 2dc-V stitch into next ch2-space, skip 2 sts, dc into next st* repeat ** 6 times around, sl into 1st stitch to join. R9: *dc, skip 2 sts, 2dc-V stitch into next ch2-space, ch3, sc into ch8-space, ch6, sc into next ch8-space, ch3, 2dc- V stitch into next ch2-space, skip 2 sts, dc into next st* repeat ** 6 times around, sl into 1st stitch to join. R45: *dc, skip 2 sts, 2dc-V stitch into next ch2-space, skip next (2 sts and ch3-space), 9 tr into next ch6-space, skip next (ch3-space and 2 sts), 2dc- V stitch into next ch2-space, skip 2 sts, dc into next st, ch1* repeat ** 6 times around, sl into 1st stitch to join. R46: *dc, skip 2 sts, 2dc- V stitch into next ch2-space, ch2, skip 2 sts, sc into next st, ( ch3, skip 1 st, sc into next st ) x 4 times, ch2, skip 2 sts, 2dc-V stitch into next ch2-space, skip 2 sts, dc into next st, ch1* repeat ** 6 times around, sl into 1st stitch to join. R47: *dc, skip 2 sts, 2dc- V stitch into next ch2-space, ch3, skip next (2 sts and ch2-space), sc into next ch3-space, ( ch3, skip 1 st, sc into next ch3-space ) x 3 times, ch3, skip next (ch2-space and 2 sts), 2dc-V stitch into next ch2-space, skip 2 sts, dc into next st, ch1* repeat ** 6 times around, sl into 1st stitch to join. R48: *dc, skip 2 sts, 2dc- V stitch into next ch2-space, ch4, skip next (2 sts and ch3-space), sc into next ch3-space, ( ch3, skip 1 st, sc into next ch3-space ) x 2 times, ch4, skip next (ch3-space and 2 sts), 2dc-V stitch into next ch2-space, skip 2 sts, dc into next st, ch1* repeat ** 6 times around, sl into 1st stitch to join. R49: *dc, skip 2 sts, 2dc- V stitch into next ch2-space, ch5, skip next (2 sts and ch4-space), sc into next ch3-space, ch3, skip 1 st, sc into next ch3-space, ch5, skip next (ch4-space and 2 sts), 2dc-V stitch into next ch2-space, skip 2 sts, dc into next st, ch1* repeat ** 6 times around, sl into 1st stitch to join. R50: *dc, skip 2 sts, 2dc- V stitch into next ch2-space, ch8, skip next (2sts and ch5-space), sc into ch3-space, ch8, skip next (ch5-space and 2 sts), 2dc-V stitch into next ch2-space, skip 2 sts, dc into next st, ch1* repeat ** 6 times around, sl into 1st stitch to join. R51: *dc, skip 2 sts, 2dc-V stitch into next ch2-space, ch3, sc into ch8-space, ch6, sc into next ch8-space, ch3, 2dc- V stitch into next ch2-space, skip 2 sts, dc into next st, ch1* repeat ** 6 times around, sl into 1st stitch to join. R52: *dc, skip 2 sts, 2dc-V stitch into next ch2-space, skip next (2 sts and ch3-space), 9 tr into next ch6-space, skip next (ch3-space and 2 sts), 2dc- V stitch into next ch2-space, skip 2 sts, dc into next st, ch2* repeat ** 6 times around, sl into 1st stitch to join. R53: *dc, skip 2 sts, 2dc- V stitch into next ch2-space, ch2, skip 2 sts, sc into next st, ( ch3, skip 1 st, sc into next st ) x 4 times, ch2, skip 2 sts, 2dc-V stitch into next ch2-space, skip 2 sts, dc into next st, ch2* repeat ** 6 times around, sl into 1st stitch to join. R54: *dc, skip 2 sts, 2dc- V stitch into next ch2-space, ch3, skip next (2 sts and ch2-space), sc into next ch3-space, ( ch3, skip 1 st, sc into next ch3-space ) x 3 times, ch3, skip next (ch2-space and 2 sts), 2dc-V stitch into next ch2-space, skip 2 sts, dc into next st, ch2* repeat ** 6 times around, sl into 1st stitch to join. R55: *dc, skip 2 sts, 2dc- V stitch into next ch2-space, ch4, skip next (2 sts and ch3-space), sc into next ch3-space, ( ch3, skip 1 st, sc into next ch3-space ) x 2 times, ch4, skip next (ch3-space and 2 sts), 2dc-V stitch into next ch2-space, skip 2 sts, dc into next st, ch2* repeat ** 6 times around, sl into 1st stitch to join. R56: *dc, skip 2 sts, 2dc- V stitch into next ch2-space, ch5, skip next (2 sts and ch4-space), sc into next ch3-space, ch3, skip 1 st, sc into next ch3-space, ch5, skip next (ch4-space and 2 sts), 2dc-V stitch into next ch2-space, skip 2 sts, dc into next st, ch2* repeat ** 6 times around, sl into 1st stitch to join. R57: *dc, skip 2 sts, 2dc- V stitch into next ch2-space, ch8, skip next (2sts and ch5-space), sc into ch3-space, ch8, skip next (ch5-space and 2 sts), 2dc-V stitch into next ch2-space, skip 2 sts, dc into next st, ch2* repeat ** 6 times around, sl into 1st stitch to join. R58: *dc, skip 2 sts, 2dc-V stitch into next ch2-space, ch3, sc into ch8-space, ch6, sc into next ch8-space, ch3, 2dc- V stitch into next ch2-space, skip 2 sts, dc into next st, ch2* repeat ** 6 times around, sl into 1st stitch to join. R59: *dc, skip 2 sts, 2dc-V stitch into next ch2-space, skip next (2 sts and ch3-space), 9 tr into next ch6-space, skip next (ch3-space and 2 sts), 2dc- V stitch into next ch2-space, skip 2 sts, dc into next st, ch1, dc into next ch2-space, ch1* repeat ** 6 times around, sl into 1st stitch to join. R60: *dc, skip 2 sts, 2dc- V stitch into next ch2-space, ch2, skip 2 sts, sc into next st, ( ch3, skip 1 st, sc into next st ) x 4 times, ch2, skip 2 sts, 2dc-V stitch into next ch2-space, skip 2 sts, dc into next st, ch1, dc into next st, ch1* repeat ** 6 times around, sl into 1st stitch to join. R61: *dc, skip 2 sts, 2dc- V stitch into next ch2-space, ch3, skip next (2 sts and ch2-space), sc into next ch3-space, ( ch3, skip 1 st, sc into next ch3-space ) x 3 times, ch3, skip next (ch2-space and 2 sts), 2dc-V stitch into next ch2-space, skip 2 sts, dc into next st, ch1, dc into next st, ch1* repeat ** 6 times around, sl into 1st stitch to join. R62: *dc, skip 2 sts, 2dc- V stitch into next ch2-space, ch4, skip next (2 sts and ch3-space), sc into next ch3-space, ( ch3, skip 1 st, sc into next ch3-space ) x 2 times, ch4, skip next (ch3-space and 2 sts), 2dc-V stitch into next ch2-space, skip 2 sts, dc into next st, ch1, dc into next st, ch1* repeat ** 6 times around, sl into 1st stitch to join. R63: *dc, skip 2 sts, 2dc- V stitch into next ch2-space, ch5, skip next (2 sts and ch4-space), sc into next ch3-space, ch3, skip 1 st, sc into next ch3-space, ch5, skip next (ch4-space and 2 sts), 2dc-V stitch into next ch2-space, skip 2 sts, dc into next st, ch1, dc into next st, ch1* repeat ** 6 times around, sl into 1st stitch to join. R64: *dc, skip 2 sts, 2dc- V stitch into next ch2-space, ch8, skip next (2sts and ch5-space), sc into ch3-space, ch8, skip next (ch5-space and 2 sts), 2dc-V stitch into next ch2-space, skip 2 sts, dc into next st, ch1, dc into next st, ch1* repeat ** 6 times around, sl into 1st stitch to join. R65: *dc, skip 2 sts, 2dc-V stitch into next ch2-space, ch3, sc into ch8-space, ch6, sc into next ch8-space, ch3, 2dc- V stitch into next ch2-space, skip 2 sts, dc into next st, ch1, dc into next st, ch1* repeat ** 6 times around, sl into 1st stitch to join. R66: *dc, skip 2 sts, 2dc-V stitch into next ch2-space, skip next (2 sts and ch3-space), 9 tr into next ch6-space, skip next (ch3-space and 2 sts), 2dc- V stitch into next ch2-space, skip 2 sts, dc into next st, skip next ch1-space, V stitch into next dc, skip next ch1-space* repeat ** 6 times around, sl into 1st stitch to join. R67: *dc, skip 2 sts, 2dc- V stitch into next ch2-space, ch2, skip 2 sts, sc into next st, ( ch3, skip 1 st, sc into next st ) x 4 times, ch2, skip 2 sts, 2dc-V stitch into next ch2-space, skip 2 sts, dc into next st, V stitch into next ch2-space* repeat ** 6 times around, sl into 1st stitch to join. R68: *dc, skip 2 sts, 2dc- V stitch into next ch2-space, ch3, skip next (2 sts and ch2-space), sc into next ch3-space, ( ch3, skip 1 st, sc into next ch3-space ) x 3 times, ch3, skip next (ch2-space and 2 sts), 2dc-V stitch into next ch2-space, skip 2 sts, dc into next st, V stitch into next ch2-space* repeat ** 6 times around, sl into 1st stitch to join. R69: *dc, skip 2 sts, 2dc- V stitch into next ch2-space, ch4, skip next (2 sts and ch3-space), sc into next ch3-space, ( ch3, skip 1 st, sc into next ch3-space ) x 2 times, ch4, skip next (ch3-space and 2 sts), 2dc-V stitch into next ch2-space, skip 2 sts, dc into next st, V stitch into next ch2-space* repeat ** 6 times around, sl into 1st stitch to join. R70: *dc, skip 2 sts, 2dc- V stitch into next ch2-space, ch5, skip next (2 sts and ch4-space), sc into next ch3-space, ch3, skip 1 st, sc into next ch3-space, ch5, skip next (ch4-space and 2 sts), 2dc-V stitch into next ch2-space, skip 2 sts, dc into next st, V stitch into next ch2-space* repeat ** 6 times around, sl into 1st stitch to join. R71: *dc, skip 2 sts, 2dc- V stitch into next ch2-space, ch8, skip next (2sts and ch5-space), sc into ch3-space, ch8, skip next (ch5-space and 2 sts), 2dc-V stitch into next ch2-space, skip 2 sts, dc into next st, V stitch into next ch2-space* repeat ** 6 times around, sl into 1st stitch to join. R72: *dc, skip 2 sts, 2dc-V stitch into next ch2-space, ch3, sc into ch8-space, ch6, sc into next ch8-space, ch3, 2dc- V stitch into next ch2-space, skip 2 sts, dc into next st, V stitch into next ch2-space* repeat ** 6 times around, sl into 1st stitch to join. R73: *dc, skip 2 sts, 2dc-V stitch into next ch2-space, skip next (2 sts and ch3-space), 9 tr into next ch6-space, skip next (ch3-space and 2 sts), 2dc- V stitch into next ch2-space, skip 2 sts, dc into next st, ch2, skip next st, dc into next ch2-space, skip next st, ch2* repeat ** 6 times around, sl into 1st stitch to join. R74: *dc, skip 2 sts, 2dc- V stitch into next ch2-space, ch2, skip 2 sts, sc into next st, ( ch3, skip 1 st, sc into next st ) x 4 times, ch2, skip 2 sts, 2dc-V stitch into next ch2-space, skip 2 sts, dc into next st, ch2, skip next ch2-space, dc into next st, ch2, skip next ch2-space* repeat ** 6 times around, sl into 1st stitch to join. R75: *dc, skip 2 sts, 2dc- V stitch into next ch2-space, ch3, skip next (2 sts and ch2-space), sc into next ch3-space, ( ch3, skip 1 st, sc into next ch3-space ) x 3 times, ch3, skip next (ch2-space and 2 sts), 2dc-V stitch into next ch2-space, skip 2 sts, dc into next st, ch2, skip next ch2-space, dc into next st, ch2, skip next ch2-space* repeat ** 6 times around, sl into 1st stitch to join. R76: *dc, skip 2 sts, 2dc- V stitch into next ch2-space, ch4, skip next (2 sts and ch3-space), sc into next ch3-space, ( ch3, skip 1 st, sc into next ch3-space ) x 2 times, ch4, skip next (ch3-space and 2 sts), 2dc-V stitch into next ch2-space, skip 2 sts, dc into next st, ch2, skip next ch2-space, dc into next st, ch2, skip next ch2-space* repeat ** 6 times around, sl into 1st stitch to join. R77: *dc, skip 2 sts, 2dc- V stitch into next ch2-space, ch5, skip next (2 sts and ch4-space), sc into next ch3-space, ch3, skip 1 st, sc into next ch3-space, ch5, skip next (ch4-space and 2 sts), 2dc-V stitch into next ch2-space, skip 2 sts, dc into next st, ch2, skip next ch2-space, dc into next st, ch2, skip next ch2-space* repeat ** 6 times around, sl into 1st stitch to join. R78: *dc, skip 2 sts, 2dc- V stitch into next ch2-space, ch8, skip next (2sts and ch5-space), sc into ch3-space, ch8, skip next (ch5-space and 2 sts), 2dc-V stitch into next ch2-space, skip 2 sts, dc into next st, ch2, skip next ch2-space, dc into next st, ch2, skip next ch2-space* repeat ** 6 times around, sl into 1st stitch to join. R79: *dc, skip 2 sts, 2dc-V stitch into next ch2-space, ch3, sc into ch8-space, ch6, sc into next ch8-space, ch3, 2dc- V stitch into next ch2-space, skip 2 sts, dc into next st, ch2, skip next ch2-space, dc into next st, ch2, skip next ch2-space* repeat ** 6 times around, sl into 1st stitch to join. R80: *dc, skip 2 sts, 2dc-V stitch into next ch2-space, skip next (2 sts and ch3-space), 9 tr into next ch6-space, skip next (ch3-space and 2 sts), 2dc- V stitch into next ch2-space, skip 2 sts, dc into next st, ch1, dc into next ch2-space, V stitch into next dc, dc into next ch2-space, ch1* repeat ** 6 times around, sl into 1st stitch to join. R81: *dc, skip 2 sts, 2dc- V stitch into next ch2-space, ch2, skip 2 sts, sc into next st, ( ch3, skip 1 st, sc into next st ) x 4 times, ch2, skip 2 sts, 2dc-V stitch into next ch2-space, skip 2 sts, dc into next st, ch1, skip next ch1-space, dc into next st, V stitch into next ch2-space, dc into next st, ch1, skip next ch1-space* repeat ** 6 times around, sl into 1st stitch to join. R82: *dc, skip 2 sts, 2dc- V stitch into next ch2-space, ch3, skip next (2 sts and ch2-space), sc into next ch3-space, ( ch3, skip 1 st, sc into next ch3-space ) x 3 times, ch3, skip next (ch2-space and 2 sts), 2dc-V stitch into next ch2-space, skip 2 sts, dc into next st, ch1, skip next ch1-space, dc into next st, V stitch into next ch2-space, dc into next st, ch1, skip next ch1-space* repeat ** 6 times around, sl into 1st stitch to join. R83: *dc, skip 2 sts, 2dc- V stitch into next ch2-space, ch4, skip next (2 sts and ch3-space), sc into next ch3-space, ( ch3, skip 1 st, sc into next ch3-space ) x 2 times, ch4, skip next (ch3-space and 2 sts), 2dc-V stitch into next ch2-space, skip 2 sts, dc into next st, ch1, skip next ch1-space, dc into next st, V stitch into next ch2-space, dc into next st, ch1, skip next ch1-space* repeat ** 6 times around, sl into 1st stitch to join. R84: *dc, skip 2 sts, 2dc- V stitch into next ch2-space, ch5, skip next (2 sts and ch4-space), sc into next ch3-space, ch3, skip 1 st, sc into next ch3-space, ch5, skip next (ch4-space and 2 sts), 2dc-V stitch into next ch2-space, skip 2 sts, dc into next st, ch1, skip next ch1-space, dc into next st, V stitch into next ch2-space, dc into next st, ch1, skip next ch1-space* repeat ** 6 times around, sl into 1st stitch to join. R85: *dc, skip 2 sts, 2dc- V stitch into next ch2-space, ch8, skip next (2sts and ch5-space), sc into ch3-space, ch8, skip next (ch5-space and 2 sts), 2dc-V stitch into next ch2-space, skip 2 sts, dc into next st, ch1, skip next ch1-space, dc into next st, V stitch into next ch2-space, dc into next st, ch1, skip next ch1-space* repeat ** 6 times around, sl into 1st stitch to join. R86: *dc, skip 2 sts, 2dc-V stitch into next ch2-space, ch3, sc into ch8-space, ch6, sc into next ch8-space, ch3, 2dc- V stitch into next ch2-space, skip 2 sts, dc into next st, ch1, skip next ch1-space, dc into next st, V stitch into next ch2-space, dc into next st, ch1, skip next ch1-space* repeat ** 6 times, sl into 1st stitch to join. R87: *dc, skip 2 sts, 2dc-V stitch into next ch2-space, skip next (2 sts and ch3-space), 9 tr into next ch6-space, skip next (ch3-space and 2 sts), 2dc- V stitch into next ch2-space, skip 2 sts, dc into next st, ch2, skip next ch1-space, dc into next st, ch2, skip next st, dc into next ch2-space, ch2, skip next st, dc into next st, ch2, skip next ch1-space* repeat ** 6 times around, sl into 1st stitch to join. R88: *dc, skip 2 sts, 2dc- V stitch into next ch2-space, ch2, skip 2 sts, sc into next st, ( ch3, skip 1 st, sc into next st ) x 4 times, ch2, skip 2 sts, 2dc-V stitch into next ch2-space, skip 2 sts, dc into next st, ( ch2, skip next ch2-space, dc into next st ) x 3 times across, ch2, skip next ch2-space* repeat ** 6 times around, sl into 1st stitch to join. R89: *dc, skip 2 sts, 2dc- V stitch into next ch2-space, ch3, skip next (2 sts and ch2-space), sc into next ch3-space, ( ch3, skip 1 st, sc into next ch3-space ) x 3 times, ch3, skip next (ch2-space and 2 sts), 2dc-V stitch into next ch2-space, skip 2 sts, dc into next st, ( ch2, skip next ch2-space, dc into next st ) x 3 times across, ch2, skip next ch2-space* repeat ** 6 times around, sl into 1st stitch to join. R90: *dc, skip 2 sts, 2dc- V stitch into next ch2-space, ch4, skip next (2 sts and ch3-space), sc into next ch3-space, ( ch3, skip 1 st, sc into next ch3-space ) x 2 times, ch4, skip next (ch3-space and 2 sts), 2dc-V stitch into next ch2-space, skip 2 sts, dc into next st, ( ch2, skip next ch2-space, dc into next st ) x 3 times across, ch2, skip next ch2-space* repeat ** 6 times around, sl into 1st stitch to join. R91: *dc, skip 2 sts, 2dc- V stitch into next ch2-space, ch5, skip next (2 sts and ch4-space), sc into next ch3-space, ch3, skip 1 st, sc into next ch3-space, ch5, skip next (ch4-space and 2 sts), 2dc-V stitch into next ch2-space, skip 2 sts, dc into next st, ( ch2, skip next ch2-space, dc into next st ) x 3 times across, ch2, skip next ch2-space* repeat ** 6 times around, sl into 1st stitch to join. R92: *dc, skip 2 sts, 2dc- V stitch into next ch2-space, ch8, skip next (2sts and ch5-space), sc into ch3-space, ch8, skip next (ch5-space and 2 sts), 2dc-V stitch into next ch2-space, skip 2 sts, dc into next st, ( ch2, skip next ch2-space, dc into next st ) x 3 times across, ch2, skip next ch2-space* repeat ** 6 times around, sl into 1st stitch to join. R93: *dc, skip 2 sts, 2dc-V stitch into next ch2-space, ch3, sc into ch8-space, ch6, sc into next ch8-space, ch3, 2dc- V stitch into next ch2-space, skip 2 sts, dc into next st, ( ch2, skip next ch2-space, dc into next st ) x 3 times across, ch2, skip next ch2-space* repeat ** 6 times around, sl into 1st stitch to join. R94: *dc, skip 2 sts, 2dc-V stitch into next ch2-space, skip next (2 sts and ch3-space), 9 tr into next ch6-space, skip next (ch3-space and 2 sts), 2dc- V stitch into next ch2-space, skip 2 sts, dc into next st, ( ch2, skip next ch2-space, V stitch into next st ) x 3 times across, ch2, skip next ch2-space * repeat ** 6 times around, sl into 1st stitch to join. R95: *dc, skip 2 sts, 2dc- V stitch into next ch2-space, ch2, skip 2 sts, sc into next st, ( ch3, skip 1 st, sc into next st ) x 4 times, ch2, skip 2 sts, 2dc-V stitch into next ch2-space, skip 2 sts, dc into next st, ( ch2, skip next ch2-space, V stitch into next ch2-space ) x 3 times across, ch2, skip next ch2-space* repeat ** 6 times around, sl into 1st stitch to join. R96: *dc, skip 2 sts, 2dc- V stitch into next ch2-space, ch3, skip next (2 sts and ch2-space), sc into next ch3-space, ( ch3, skip 1 st, sc into next ch3-space ) x 3 times, ch3, skip next (ch2-space and 2 sts), 2dc-V stitch into next ch2-space, skip 2 sts, dc into next st, ( ch2, skip next ch2-space, V stitch into next ch2-space ) x 3 times across, ch2, skip next ch2-space* repeat ** 6 times around, sl into 1st stitch to join. R97: *dc, skip 2 sts, 2dc- V stitch into next ch2-space, ch4, skip next (2 sts and ch3-space), sc into next ch3-space, ( ch3, skip 1 st, sc into next ch3-space ) x 2 times, ch4, skip next (ch3-space and 2 sts), 2dc-V stitch into next ch2-space, skip 2 sts, dc into next st, ( ch2, skip next ch2-space, V stitch into next ch2-space ) x 3 times across, ch2, skip next ch2-space* repeat ** 6 times around, sl into 1st stitch to join. R98: *dc, skip 2 sts, 2dc- V stitch into next ch2-space, ch5, skip next (2 sts and ch4-space), sc into next ch3-space, ch3, skip 1 st, sc into next ch3-space, ch5, skip next (ch4-space and 2 sts), 2dc-V stitch into next ch2-space, skip 2 sts, dc into next st, ( ch2, skip next ch2-space, V stitch into next ch2-space ) x 3 times across, ch2, skip next ch2-space* repeat ** 6 times around, sl into 1st stitch to join. R99: *dc, skip 2 sts, 2dc- V stitch into next ch2-space, ch8, skip next (2sts and ch5-space), sc into ch3-space, ch8, skip next (ch5-space and 2 sts), 2dc-V stitch into next ch2-space, skip 2 sts, dc into next st, ( ch2, skip next ch2-space, V stitch into next ch2-space ) x 3 times across, ch2, skip next ch2-space* repeat ** 6 times around, sl into 1st stitch to join. R100: *dc, skip 2 sts, 2dc-V stitch into next ch2-space, ch3, sc into ch8-space, ch6, sc into next ch8-space, ch3, 2dc- V stitch into next ch2-space, skip 2 sts, dc into next st, ( ch2, skip next ch2-space, V stitch into next ch2-space ) x 3 times across, ch2, skip next ch2-space* repeat ** 6 times around, sl into 1st stitch to join. R101: *dc, skip 2 sts, 2dc-V stitch into next ch2-space, skip next (2 sts and ch3-space), 9 tr into next ch6-space, skip next (ch3-space and 2 sts), 2dc- V stitch into next ch2-space, skip 2 sts, dc into next st, ch2, dc into next ch2-space, (ch2, skip next st, dc into next ch2-space) x 6 times, ch2 * repeat ** 6 times around, sl into 1st stitch to join. R102: *dc, skip 2 sts, 2dc- V stitch into next ch2-space, ch2, skip 2 sts, sc into next st, ( ch3, skip 1 st, sc into next st ) x 4 times, ch2, skip 2 sts, 2dc-V stitch into next ch2-space, skip 2 sts, dc into next st,( ch2, skip next ch2-space, dc into next st ) x 7 times, ch2, skip next ch2-space* repeat ** 6 times around, sl into 1st stitch to join. R103: *dc, skip 2 sts, 2dc- V stitch into next ch2-space, ch3, skip next (2 sts and ch2-space), sc into next ch3-space, ( ch3, skip 1 st, sc into next ch3-space ) x 3 times, ch3, skip next (ch2-space and 2 sts), 2dc-V stitch into next ch2-space, skip 2 sts, dc into next st, ( ch2, skip next ch2-space, dc into next st ) x 7 times, ch2, skip next ch2-space * repeat ** 6 times around, sl into 1st stitch to join. R104: *dc, skip 2 sts, 2dc- V stitch into next ch2-space, ch4, skip next (2 sts and ch3-space), sc into next ch3-space, ( ch3, skip 1 st, sc into next ch3-space ) x 2 times, ch4, skip next (ch3-space and 2 sts), 2dc-V stitch into next ch2-space, skip 2 sts, dc into next st, ( ch2, skip next ch2-space, dc into next st ) x 7 times, ch2, skip next ch2-space* repeat ** 6 times around, sl into 1st stitch to join. R105: *dc, skip 2 sts, 2dc- V stitch into next ch2-space, ch5, skip next (2 sts and ch4-space), sc into next ch3-space, ch3, skip 1 st, sc into next ch3-space, ch5, skip next (ch4-space and 2 sts), 2dc-V stitch into next ch2-space, skip 2 sts, dc into next st, ( ch2, skip next ch2-space, dc into next st ) x 7 times, ch2, skip next ch2-space* repeat ** 6 times around, sl into 1st stitch to join. R106: *dc, skip 2 sts, 2dc- V stitch into next ch2-space, ch8, skip next (2sts and ch5-space), sc into ch3-space, ch8, skip next (ch5-space and 2 sts), 2dc-V stitch into next ch2-space, skip 2 sts, dc into next st, ( ch2, skip next ch2-space, dc into next st ) x 7 times, ch2, skip next ch2-space* repeat ** 6 times around, sl into 1st stitch to join. R107: *dc, skip 2 sts, 2dc-V stitch into next ch2-space, ch3, sc into ch8-space, ch6, sc into next ch8-space, ch3, 2dc- V stitch into next ch2-space, skip 2 sts, dc into next st, ( ch2, skip next ch2-space, dc into next st ) x 7 times, ch2, skip next ch2-space* repeat ** 6 times around, sl into 1st stitch to join. R108: *dc, skip 2 sts, 2dc-V stitch into next ch2-space, skip next (2 sts and ch3-space), 9 tr into next ch6-space, skip next (ch3-space and 2 sts), 2dc- V stitch into next ch2-space, skip 2 sts, dc into next st, ( ch2, skip next ch2-space, dc into next st ) x 7 times, ch2, skip next ch2-space * repeat ** 6 times around, sl into 1st stitch to join. Steamblock your finished project if needed. I’m starting this now. I’m a little confused… the * on second row begins BEFORE the 1st DC. Does this mean the pattern begins and ends with a DC or only has one single DC between the pattern sets? I did with beginning and ending as it’s written and keep ending up with 2 sp left. I have 6 sets total and have triple counted that I have 114 sts on first row. The panel begins with 1dc and end with 1dc ( 19 stitches for each panel ). Hi! This dress is truly gorgeous. However, I just bought the patttern and I am really disappointed that the only direction to change size is change of hook! Resulting in loose pattern… Can you at least tell me how many ch goes in repetition of the pattern? I mean the beginning ch’s how many extra ch i could make and still be able to follow the pattern (pineapple stitch and panel between) … I am size xxl…. The pineapple stitch is a stretchy crochet stitch so I suggested changing the hook size to make it simpler. However, as you asked, the foundation chain is multiples of 19 (pineapple stitch and panel between). Thank you very much 🙂 am exited about the project! Beautiful!!! You’re so creative and patient, lol I would of gotten frustrated half way and give up. I featured this amazing dress at this week’s Submarine Sunday! It’s really stunning! Beautiful dress! Such intricate details, your creativity is absolutely amazing! Beautiful dress!! You did an amazing job, you are one gifted person!! I would never attempt to make this! Absolutely stunning! You are truly an artist. Thank you for sharing this with us at Treasure Box Tuesday- pinned! wow. speechless. this is so beautiful maz!